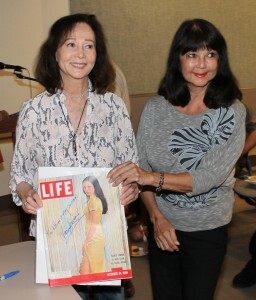 Nancy Kwan, star of Rogers & Hammerstein’s “Flower Drum Song” visited with Monterey Park resident Carol Sullivan on July 27 in the Monterey Park Bruggemeyer’s Friends Room for a screening of the 1961 movie. Librarian Cindy Costales welcomed the audience to this special event sponsored by the Friends of the Library and the Monterey Park Historical Society. She thanked former resident Foster Hirsch for providing movies to the Monterey Park audience for the last several years. She thanked Beryl Williams, a member of the Historical Society and longtime resident Cindy Yee for inviting Nancy Kwan to this special event. There is an exhibit of Nancy Kwan’s memorabilia in the library. 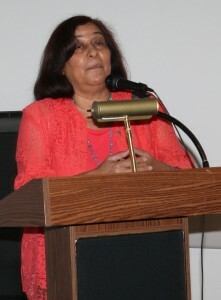 She thanked Joan Merino, a Friend of the Library for their promotion of this event. She introduced City Clerk Vince Chang. She thanked longtime residents and actors Howard Fong and Cici Lau for their support of this event. She asked everyone to enjoy this program. Professor Foster Hirsch, a former resident and a Mark Keppel High School alumnus and film historian introduced the 1961 film “Flower Drum Song”. This film is about change. Asian actors are still not represented in the industry. The film was controversial with the question “What is an American?” There were pros and cons about the performers. Nancy Kwan is the first Asian-American star. The audience enjoyed the full-length movie that featured the first cast of Asian actors as strong Chinese characters who achieve success and happiness. 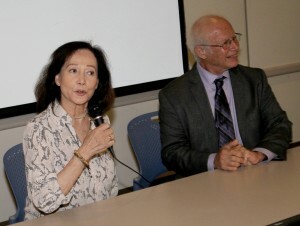 Nancy Kwan, who was Linda Low in the film and Professor Foster Hirsch spoke about the movie and her career in the industry. Nancy Kwan was trained in ballet and she enjoyed the various dances in the movie. She recalled that the cast trained for six weeks on the dances. Fred Astaire watched them dancing. She did not sing in the movie because the director did not want her to sing and dance at the same time. Her favorite song is “Enjoy Being a Girl” that took a lot of time to film because they filmed five images of her in the mirrors. C. Y. Lee wrote the “Flower Drum Song” as a novel. Rogers & Hammerstein set it to music for Broadway and later it was produced as a movie. Ross Hunter cast her a Linda Low when he met her at a party. She called Linda Low a modern woman. Nancy Kwan was born in Hong Kong to a Chinese father and an English mother. She spoke both Chinese and English at home. She attended Catholic schools. Nancy Kwan is the first Asian star. She has also directed and produces several shows. She helped to promote Asian singers and dancers. The “Flower Drum Song” is the film that broke stereotypes in the industry. Professor Foster Hirsch thanked everyone for coming to this special event with Nancy Kwan. She is the last living star of the movie. Nancy Kwan graciously signed autographic for her many fans at the end of the event. Thank you for this article and picture of Nancy Kwan and myself with all the information of Nancy and all the people who help this event come to our City of Monterey Park. ,When I was in High School at Mark Keppel the world of Susie Wong came out at the Garfield Theater in Alhambra and I told Nancy Kwan about that story and felt a small connection with her. Thank you always for Your commitment to our great city.